In the entrepreneurial world, no one knows the hustle better than artists, including writers, like myself. Solopreneurs to the max, we must simultaneously nurture our creative vision while navigating the world of promotion. We must be in charge of creating a product as well as selling it, activities that can certainly feel at odds with one another. If we stick with the game long enough, we learn that the secret to a successful business lies in our ability to engage all aspects of ourselves as a unified whole. Indeed, our strength as individuals lies in our ability to create broad appeal around the uniqueness of our personalities. I recently had a chat with my good friend and colleague, creative development advisor Marc Zegans. A graduate of Harvard University’s Kennedy School of Government and a former public policy wonk and advisor, Zegans has focused his extensive business and development acumen on artists looking to develop sustainable and successful careers in their creative fields. When it comes to the visual arts, he understands well that real collectors are investing in artists, not just their art. We talked about how business owners can take a page from the playbook of some of the art world’s more memorable personalities, by learning how to stand out. Here're his answers to the questions I had. When You Say 'Stand Out,' What do You Mean? "Standing out means you’re recognized for being the person associated with the way your company improves people’s lives, the way your company makes a difference. It means that your customers and prospects see you as the go-to person when they need something done and done right." Why Should Business Owners be Interested in Standing Out? "As a small business person, standing out for the right reasons is the best way to grow. If you stand out in a way that resonates with your business, you draw customers, build a reputation, attract investors, invite opportunities, and make things happen." Do you Think Being a Standout is Something People just Are or Aren’t, or is it a Skill that can be Learned? "It can, and it has to be learned because you want to stand out in the right way. Being different in ways that people don’t appreciate is easy, but to do it in a smart way, not only do you need to create a distinctive impression, but the impression you make must be strategically linked to your business goals and the type of reputation you want to develop." 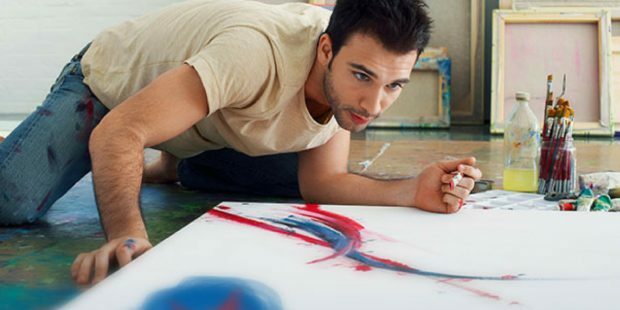 #Entrepreneurs, here're 5 ways you can use #artist techniques to run a successful #business. Who are Some Business People who Exemplify this Kind of Big Personality You’re Describing? "If you want to preside over an organization that makes a living presenting hip, entrepreneurial ideas, look at Richard Branson. He’s done this for his entire career. Virgin made the airline business fun and made the record industry fun. Now he’s getting into the space industry. He does big, new, cool things in splashy ways, and when you look at him as a person, he lives what he does. On the flipside, you have Ben and Jerry. They were these roly-poly Vermont hippie guys who totally lived the hippie lifestyle and hippie values. They became two of the most well-known business leaders with one of the most popular ice cream companies in the world, and they sold it for a fortune. Another one is Doctor Dre. The ultimate producer, he stands out as a musical genius with a great eye for talent. He launched Beats with Jimmy Iovine and sold it to Apple for 3 billion dollars. What ties all of them together is that you have a clear, consistent image of each. As soon as you hear their names, you recognize their distinctive personalities. By contrast, a corporate leader like Ginni Rometty, despite being the first woman CEO of IBM, has a name that most people wouldn’t recognize. The type of smart hustle required to become a successful small business entrepreneur makes different demands than fitting in with the kind of established corporate culture she presides over." Who are Some Memorable Artists Who Demonstrate this Type of Big Presence? "When you ask an average person on the street about artists they remember, it’s Andy Warhol and Picasso. Their work was innovative and visually compelling, but that wasn’t enough. People knew who Andy was - the freak in the white hair and dark glasses who hung out with the coolest and most out-there people. And Picasso was this bull of a man who slept his way through Europe and invented eight million kinds of art - he kept reinventing the way we see. They each created a potent picture of who they were, and it helped them sell their work. People believed the image because these artists lived it. The way Picasso and Warhol stood out in life draws people’s interest and helps to drive the market for their work. When you buy a Warhol or a Picasso, you not only get a piece of work, but you get a story and a tiny bit of celebrity for yourself. As an entrepreneur, when you stand out as memorable and attractive, people want to say they know you, and that’s when the world starts coming to you."